Dharma (Sanskrit) or dhamma (Pali) is a word Buddhists use often. It refers to the second gem of the Three Jewels of Buddhism--Buddha, dharma, sangha. The word often is defined as "the teachings of the Buddha," but dharma is really more than just a label for Buddhist doctrines, as we shall see below. The word dharma comes from the ancient religions of India and is found in Hindu and Jain teachings, as well as Buddhist. Its original meaning is something like "natural law." Its root word, dham, means "to uphold" or "to support." In this broad sense common to many religious traditions, Dharma is that which upholds the natural order of the universe. This meaning is part of the Buddhist understanding, also. Dhamma is the nature of what-is; the truth of what the Buddha taught. In Theravada Buddhism, as in the quote above, it is sometimes used to indicate all the factors of existence. Thanissaro Bhikkhu wrote that "Dhamma, on the external level, refers to the path of practice the Buddha taught to his followers" This Dhamma has three levels of meaning: the words of the Buddha, the practice of his teaching, and the attainment of enlightenment. So, Dhamma is not just doctrines--it is teaching plus practice plus enlightenment. The late Buddhadasa Bhikkhu taught that the word dhamma has a fourfold meaning. Dhamma incorporates the phenomenal world as it is; the laws of nature; the duties to be performed in accordance with the laws of nature; and the results of fulfilling such duties. This aligns with the way dharma/dhamma was understood in the Vedas. Buddhadasa also taught that dhamma has six attributes. First, it was taught comprehensively by the Buddha. Second, all of us can realize Dhamma through our own efforts. Third, it is timeless and present in every immediate moment. Fourth, it is open to verification and does not have to be accepted on faith. Fifth, it allows us to enter Nirvana. And sixth, it is known only through personal, intuitive insight. Mahayana Buddhism generally uses the word dharma to refer to both the teachings of the Buddha and the realization of enlightenment. More often than not, use of the word incorporates both meanings at once. To speak of someone's understanding of dharma is not to comment on how well that person can recite Buddhist doctrines but on his state of realization. In the Zen tradition, for example, to present or expound upon the dharma usually refers to presenting some aspect of the true nature of reality. 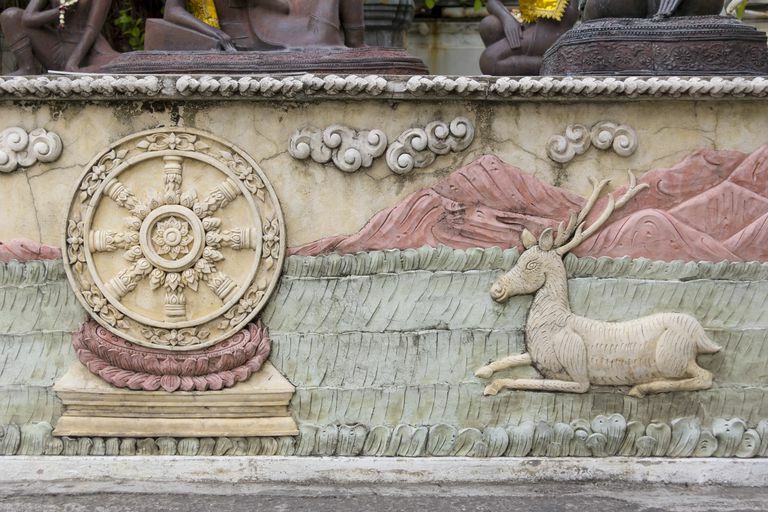 Early Mahayana scholars developed the metaphor of "three turnings of the dharma wheel" to refer to three revelations of teachings. According to this metaphor, the first turning occurred when the historical Buddha delivered his first sermon on the Four Noble Truths. The second turning refers to the perfection of wisdom teaching, or sunyata, which emerged early in the first millennium. The third turning was the development of the doctrine that Buddha nature is the fundamental unity of existence, pervading everywhere. Mahayana texts sometimes use the word dharma to mean something like "manifestation of reality." A literal translation of the Heart Sutra contains the line "Oh, Sariputra, all dharmas [are] emptiness" (iha Sariputra Sarva Dharma sunyata). Very basically, this is saying that all phenomena (dharmas) are empty (sunyata) of self-essence. Here, "all dharmas" means something like "all phenomena." Both Theravada and Mahayana Buddhists speak of the "dharma body" (dhammakaya or dharmakaya). This is also called the "truth body." Very simply, in Theravada Buddhism, a Buddha (an enlightened being) is understood to be the living embodiment of dharma. This does not mean that a Buddha's physical body (rupa-kaya) is the same thing as dharma, however. It's a bit closer to it to say that the dharma becomes visible or tangible in a Buddha. In Mahayana Buddhism, the dharmakaya is one of the three bodies (tri-kaya) of a Buddha. The dharmakaya is the unity of all things and beings, unmanifested, beyond existence and non-existence. In sum, the word dharma is nearly indefinable. But to the extent that it can be defined, we can say that dharma is both the essential nature of reality and also the teachings and practices that enable the realization of that essential nature.